JOHN ADAMS. 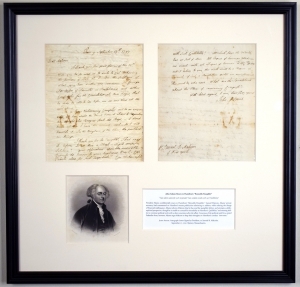 Autograph Letter Signed as President, to Samuel B. Malcom. September 17, 1797. Quincy, Mass. 2 pp. 8 x 9¾ in. I thank you for your favour of the 12th Will you be so good, as to write to Col. Pickering the Secretary of State at Trenton the substance of what you have written me, concerning Mr George Sanderson, of Lancaster in Pensylvania, and other Candidates for the Consulship at aux Cayes, that he may be able to lay before me in one view all the applications. Your electioneering campaign will be an easy one, unless, you have adopted the French Proverb Dans le Royaulme des aveugles les Borgnes sont des Roys. I dont know whether I have the original exact, so I will translate it. In the kingdom of the blind, the purblind are kings. I thank you for the pamphlet. I had read it before. Is not there a phrase-Digito compesce Labellum? Your observations upon this miserable Business do honour to your head and Heart. Can Talents atone for such Turpitude? Can Wisdom reside <2> with such Gullibility? Mr Lock says the World has all sorts of men. All Degrees of human Wisdom are mixed with all Degrees of human Folly. To me and I believe, to you, this World would be a Region of Torment, if such a Recollection existed in our Memories. This must be, entre nous. What are the Speculations about the Place of convening Congress? Referring to other political matters, Adams also responds to Malcom’s news of the recent death of the U.S. Consul to Haiti with his recommendations on possible successors, and comments on the gubernatorial “electioneering” in New York. Adams’s allusion here to the French homily, “in the land of the blind,” with respect to the contest between John Jay and Chancellor Robert Livingston is likely intended as a slight against Livingston in favor of Jay, whose legal expertise Adams admired. Samuel Bayard Malcom (1776-1815) served John Adams as private secretary for about three years before and during Adams’s presidency. He established a law practice in New York City by 1799, became a notary public in 1801, and gained admission the following year as a counsellor at law to the bar of the New York Supreme Court. Malcom married Catharine Van Rensselaer Schuyler in 1803. “Lay your finger upon your lips.” Juvenal, The Satires, 1:160.